Lights, camera, action! 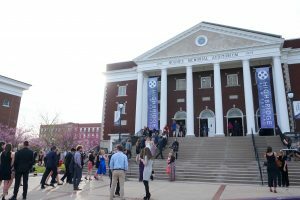 April is an exciting time at Asbury University as Engaging Culture Weekend brings Hollywood to campus. Prospective students and their families are invited to take part in the annual festivities by attending Media Communication Weekend (April 26-27). Register now! This visit event is open to high school juniors and seniors, or college transfers interested in any Asbury program, but is especially memorable for those interested in the Communication Arts Department. “If students are interested in media communication and are looking for a Christian environment, this event is not to be missed,” said Mallary Wiley, associate director for Undergraduate Admissions & coordinator for campus visits and events. Students will attend classes, worship alongside the current student body in Chapel, eat in the cafeteria and stay overnight in Asbury’s residence halls. They’ll also get to spend time with a student host at a pizza dinner Friday night. In addition to the many opportunities to explore and get to know Asbury’s campus that a typical visit event offers, Media Communication Weekend puts prospective students up close and personal with all things Communication Arts. They’ll get a tour of the Andrew S. Miller Center for Communication Arts from Dean Jim Owens and learn more about the media communication program and life at Asbury through info sessions on Friday and Saturday. Engaging Culture Weekend falls in tandem with this special visit opportunity, offering prospective students a chance to attend Engaging Culture seminars with media professionals and end their weekend by getting dressed up for the thrilling, one-of-a-kind Asbury experience that is the Highbridge Film Festival. During the weekend, students can also check out student art exhibits around campus and look forward to hearing from the Engaging Culture Chapel speaker. If you have any questions or would like more information about Media Communication Weekend, please contact Asbury’s Visit Coordinator at visit@asbury.edu. Learn more about Media Communication Weekend at Asbury.